A score of 35 wpm will get you a typing certificate. Is your typing Posture Safe? Principles for Effective Learning Typing is a closed set of skills that requires training. Through this sort of learning format, you must rely on yourself to be your own coach and trainer. This means you must consistently provide yourself with discipline, intelligent direction and encouragement. The extent to which you successfully play this coach/trainer role for yourself will largely determine how good a typist you will become! Here are the most important things that you, as your own self-coach, must always keep in the forefront of your mind. Please take them to heart; these points are CRITICAL. No mistakes. Always be sure and in control. Follow the principle of 100% correct practice: to make a mistake is to learn incorrect things, and to confuse that which you already know. Relax. No unnecessary or dysfunctional tension! Good typing technique depends on a balance between movement and stability of the fingers, hands, arms, body, AND head / eyes! This is an extremely important point which is often overlooked in the process of training typing skills. Movement: should occur primarily at the finger joints, with some forward and backward movement of the hands to reach for keys. True touch typing; typing on a keyboard with no need for looking at fingers or keys and a trained 'finger-position' sense for the physical location of keys, is the basis for development of fast and accurate typing. Developing the technique initially of knowing where all the keys are on the keyboard and which fingers to use is the initial, and most challenging, phase. It is during this stage that you should start moving away from using your vision to 'find' the keys. Once you've learned the location of keys, challenge your fingers to find the correct keys, without looking, even if you need to make frequent corrections. It is this initial challenge, goal direction, focus and discipline of training your fingers to use the correct placement and learn the position of each key that forms the basis for ongoing improvement of typing skill. Accuracy involves hitting the correct key at the correct time for good spelling and correct placement of characters. For correct key presses, your fingers should have developed a good 'kinesthetic' sense and a feeling of the position in space required for each key press. Fewer [backspace] hits to make corrections. The [backspace] key is one of the most difficult keys on the keyboard to reach. It requires a long stretch hit with the little finger on the right hand, resulting in the fingers moving away from the home row for most people. 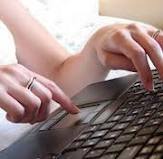 Overall, this simple act of hitting the backspace key will slow down your typing since your fingers are not maintained on the home row as in regular typing. Flow of thoughts. Fewer corrections will allow you to type fluently, getting words and information down on the page quickly and in an ordered manner. As incorrect keys are typed, your focus of attention turns to the error and correcting the error, and your fingers move to hit the [backspace] key. The more errors made, the less efficient your typing will be. Pay attention to how often you are hitting the backspace key to correct errors. 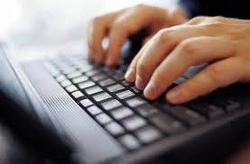 If you think you are pressing backspace too often, try slowing down your typing a bit. While speed is important, you may find that the extra time needed to correct mistakes actually takes more time in the end. Slow down your typing for a while and focus on hitting the right key every time. Then, gradually increase your speed while working on good accuracy at the same time. Speed can only increase once typing keys on the keyboard becomes a more automatic physical motor process. People normally learn 'where' the keys are on the keyboard very quickly. Developing the skill and speed to hit the letters quickly, accurately and in the correct sequence involves more effort and takes much longer. Kinesthesia is an essential motor skill that people use all the time. This allows us to ride a bike, drive a car, write, feed ourselves and perform thousands of movements a day without 'thinking' about how to perform the movement. The motor planning for these physical skills is subconscious, and the movements are 'a u t o m a t i c'! We don't need to be looking at our hands and body while performing these actions. You may have a very good knowledge of the qwerty keyboard. You may be able to remember exact locations of each letter on the keyboard. Given a blank layout, you might be able to write in most letters and numbers correctly. But - you still might be a slow, hunt-and-peck typist. This proves the point that no matter how well you know the keyboard, your fingers need to develop the movement patterns, control and 'kinesthetic' physical 'muscle and movement' memory of where each specific key is located..... without vision !! Likewise, the physical act of typing keys on the keyboard must become an 'automatic' kinesthetic task which doesn't require thinking about the keys or looking at the keyboard. Any thinking should be about the 'content' of what is being typed: the words and sentences, not the physical act of pressing the correct keys. In summary: Motor Learning and Kinesthesia - these sound like big words, but the concepts are simple. Motor or physical learning happens with repetition. Your fingers will 'learn' the movement patterns and paths for each letter. The less you rely on your vision, the more your fingers take over the motor tasks of 'remembering' the position in space of each letter. Learn where the keys are and which fingers should be used for each key. Also use good body and arm/hand positioning - good ergonomics. This will be the basis for long term good typing habits. Automatic movements are only developed through plenty of repetition and practice. Muscles and joints learn position in space and movement patterns through continuous movement in the patterns to be learned. Every athlete and sportsman knows that regardless of talent, practice is what makes the body work well. No matter how tempted you are, once you have learned the correct finger placement and which fingers to use for specific keys, practice typing without looking. Being tempted to look at your fingers reduces the motor training effect, and relies more heavily on vision for finding the correct keys rather than the kinesthetic 'muscle and sensory' senses of the fingers. Developing good speed will be significantly hindered if vision is used. This is true of the whole typing process, since looking at the keyboard results in the visual shift from keyboard to screen to paper documents, thus reducing the efficiency of typing in all ways. This point cannot be emphasized enough. Instead of focusing on accuracy of key hits, rather work on your SPEED during this second phase of training. You can make corrections later, but for now, work on getting your speed up without looking! Put a towel over your hands if necessary.